Dollops of Diane: We Got the Flu but Did We Get the Flu SHOT? Just shy of two weeks ago, our house was hit with the flu. I was the first to come down with it and I was hit hard. However, like any mom who is busy shuffling kids around, baking, and doing last minute things just a few days before Christmas, I was living in denial. I’ve had a cough since Thanksgiving(?) and thought it had just festered in to something that would quickly be cured by some antibiotics. One trip to the doctor and one chest x-ray later, I was not prescribed an antibiotic but rather sentenced to (what felt like) my death bed for the next five days. 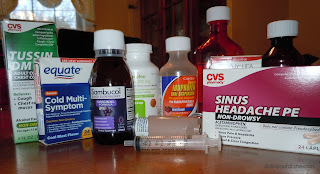 The flu then slowly but surely took down every member of our household (in varying degrees). Whenever anyone hears that we had the flu the first question that people ask is if we got the flu shot. The answer is yes, and no. In October, I dragged all three kids to the doctor’s office at 7:30pm (since that was the only open appointment that they had) to get the shots. It was past their bedtime and I had to physically restrain Isabelle who was kicking and screaming while the nurse gave her the shot. So yeah, it was basically a nightmare but it was worth it, right? My kids weren’t going to get the flu – yippee! They were surrounded by a magical anti-flu force field. My husband also got the flu shot since they give them out at his work. Me, on the other hand? I did not get the shot. My mom didn’t come drive me to the doctor (I think all the taxis in Heaven were booked) and my employer failed to set up an easily accessible time/location for me to receive the vaccination. So go figure that I am the one who comes down with it. I can’t help but think that if I had got the shot that I could have prevented it from entering our house in the first place. We could have not been home confined for twelve (TWELVE!) days. We could have celebrated Christmas with our family. We could have had a happy and healthy school break. I had never really considered that me not getting the shot would get the others sick. Clearly, I knew that I risked getting sick but I thought that even if I was sick that the flu shot would protect everyone else. I mean, isn’t that the whole point? Now I’m sure that the shot worked successfully on tons of people this year but is it too much for it to have worked on my family? What did we do to piss off the flu shot scientists? Or maybe the nurses gave us a placebo shot...oh, the conspiracy theories are endless! In all seriousness though, let me tell you that this flu that we had TOTALLY sucked. Isabelle and I (in particular) were so sick with it. If I had a magic wand, I would go back and get the flu shot in hopes that it would have prevented it from invading our house. Since I don’t have a magic wand, I’m telling YOU that you might want to consider getting vaccinated. You don’t want to be sick like we were and you don’t want to have to sit around after the fact wondering if you could have done something to prevent your entire house from being brought down by the plague. So that’s my advice – take it or leave it! Oh, and go stock up on medications either way.